Ian Gillan´s facebook page linked to the June 9th post “Deep Purple Magazine 26” today, adding good traffic to this blog right now. I´m pretty sure they only link to stuff that the man himself has given his approval to, so that makes my day. Here is another picture that was taken on that day back in 1982, Ian is signing some records etc, he signed the Episode Six photograph you can see with the words “I remember this!! Cheers. 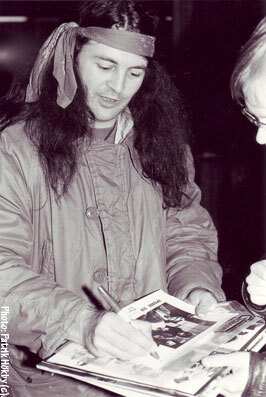 Ian Gillan”. If I can locate that I will post it on this blog.